Image credit: © David Schenfeld from Flickr. Some rights reserved. 5 m (16.4 ft); largest crocodile in Africa. Sexual Dimorphism: Males larger than females. Other features: Salt glands on tongue secrete salt and help animal adapt to salt water environments. Range: Primarily found in Africa, though native to Madagascar. In Africa, widespread distribution south of the Sahara; absent from the southern tip of Africa. Habitat: Freshwater lakes, rivers and brackish coastal swamps. IUCN Status: Least Concern; possibly threatened in some parts of range. Population in Wild: Estimated c. 250,000-500,000 but figures not reliable. Activity Cycle: Primarily nocturnal. In daylight, basks in the sun and cools off in the water when necessary. Locomotion: Avoid travel on land if possible. propulsion in water by tail and body undulations; bottom walk in shallow water. Can "high walk" with legs erect under body, dragging the tail. Diet: Varies with age. Hatchlings eat insects; adults can eat large prey such as impala, bushbucks, buffalo, young hippos, and even lions. Interspecies Interactions: Hippos and Nile Crocodiles occupy the same habitats; hippos tend to be more dominant. Common Sandpipers, and several plover species pick ectoparasites from crocodiles. Courtship: Elaborate rituals in water with males displaying to females; one to five months' interval between mating and nesting. Nesting: Colonial nesting; during dry season, female digs hole in sand near the water. Mother buries and guards eggs. Sexual Maturity: 12 -19 yrs. in wild. Longevity: long lived; survive 50-80 years in the wild. Crocodiles independently evolved a four chambered heart, as did birds and mammals but it can also function as three-chambered to save oxygen when submerged. © 2015-2019 San Diego Zoo Global. Taxonomy, population estimates, IUCN/CITES statuses updated Apr 2019. How to cite: Nile Crocodile (Crocodylus niloticus) Fact Sheet. c2014-2019. San Diego (CA): San Diego Zoo Global; [accessed YYYY Mmm dd]. 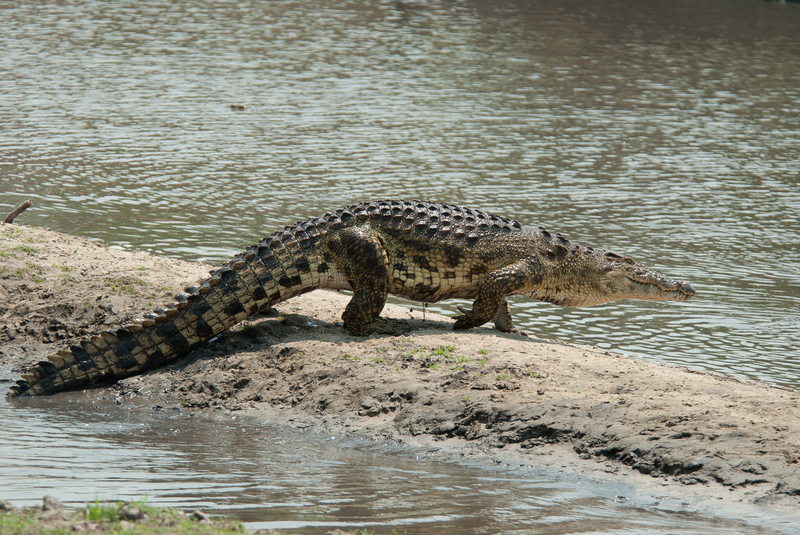 http://ielc.libguides.com/sdzg/factsheets/ nile_crocodile.